Casa Inti i Managua, Nicaragua: Reservér nu! 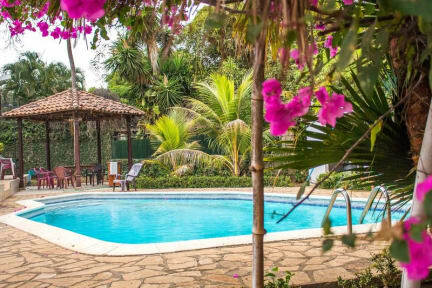 It is the perfect place to make your stay in Managua a relaxed happening with a pool on one side of the property and a garden with century old trees on the other side, a true oasis in the city where birds will wake you up instead of cars. Casa inti is located in an area called 'Las Colinas, or hills of Managua. It is a bit higher than downtown Managua which makes it some degrees cooler, with often a fresh breeze. The area is known as an Embassy area which makes it secure to walk around . Next door there are buses passing to downtown Managua, and in the other direction the buses pass towards the Masaya volcano (20 min), Masaya town (30 min) and Granada (45 min). We offer transport towards the airport at whatever time of the day. All our rooms come with a private bathroom and ceiling fan. For an additional US$ 3 we can activate the AC if this is desired. As the name says the poolside rooms give direct access to the swimming pool area.